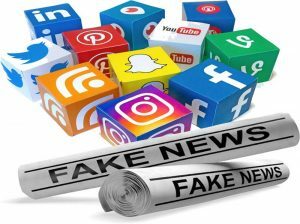 We measure trends in the diffusion of content from 570 fake news websites and 10,240 fake news stories on Facebook and Twitter between January 2015 and July 2018. User interactions with false content rose steadily on both Facebook and Twitter through the end of 2016. Since then, however, interactions with false content have fallen sharply on Facebook while continuing to rise on Twitter, with the ratio of Facebook engagements to Twitter shares decreasing by 60 percent .